Triple Layers of grosgrain ribbon, there is 120" of ribbon on this fantastic bow. 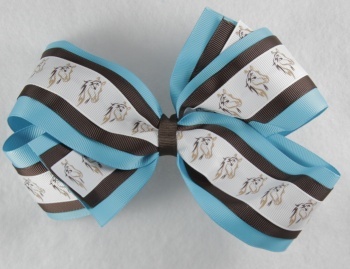 The bottom Turquoise ribbon is 2.25" wide, then a chocolate brown layer is 1.5" wide, topped by the horse print layer that is 7/8" wide. The horse has different shades of dark brown and light tan for the horse face and flowing mane. This has the great colors mixed for horse lovers.